FOX has issued the press release for the Tuesday, January 5 episode of Brooklyn Nine-Nine, "Hostage Situation". Kathryn Hahn (Transparent) guest stars as Eleanor, Boyle's ex-wife. Mary Lynn Rajskub reprises her role as Genevieve in the episode. "Hostage Situation" - Charles and Genevieve want to take their relationship to a new level, but his ex-wife, Eleanor, steamrolls their plans. Meanwhile, Amy asks Terry to write a recommendation letter with disastrous results, and Holt and Rosa enlist Gina's help to solve a case. 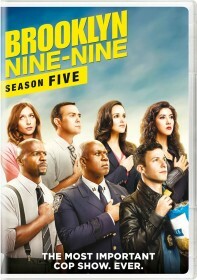 This is the first episode of Brooklyn Nine-Nine to air in the show's new Tuesdays at 9/8c time slot.